"Poet Muriel Rukeyser has said, 'What would happen if one woman told the truth about her life? The world would split open.' 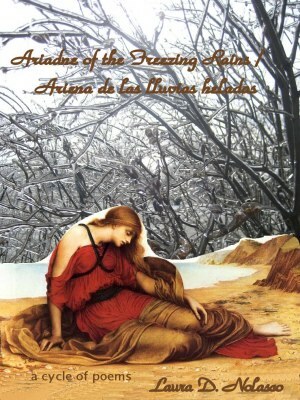 In Ariadne of the Freezing Rains, Laura D. Nolasco has done just that. Experience how an accomplished new poetic voice explores the intricacies of the human heart under assault, revealing how by the balm of language it begins to heal." Lori Nolasco says "silence has never become me." Instead, she learned to speak, and speak ecstatically, in many languages: French, Spanish, Arabic, Italian, English. This book documents her intimate dance with the many cultures she has encountered and incorporated into her lexicon: Lebanese, Parisian, Dominican, urban American. An accomplished performance poet, Lori Nolasco here captures the energy of live performance while adding subtleties noticeable only in print (such as breaking words to follow a strict haiku form in "Everyone's Bonsai"). Full of music and sazón, these poems are brash and courageous, the poetic equivalent of "green fava beans and chicken liver covered in onions and minced garlic." As readers we are fortunate, indeed, that silence does not become her. "In a high soprano voice, Laura D. Nolasco generates a topography of invisible genes, multicultural metaphors, and religious rumblings which culminate in arias of freedom, choice, and words which breathe oxygen into tired and oppressive stereotypes and traditions. She challenges women to nourish the natural instincts in their bones and experience the breath of the wild. Like Estes, her voice peaks in the branches of the bonsai tree, the wolves who run so fast that the desert shakes, and the blossoms yet to bloom in the sunlight of themselves." Night Away, an interactive creative writing workshop. ¡Ay Mami! I miss the snow. but ¡ay Mami! I miss the snow. but this is no camp. and no one's ever heard of s'mores. of the Little Virgin of Altagracia. that are two feet high. and candy canes and red-suited Santas. and parrandas and merengue and maracas. It isn't Christmas without snow. Born Lori Jean Dovidio to an Italian American family, Lori D. Nolasco uses the pen name Laura, a derivative of her given name and a salute to her heritage. She has lived in Paris, France, where she earned her Doctoral degree in Comparative Literature. The mother of two Arab American children, she has now embraced the culture of Latin America. Like Robert Frost's wife Elinor, her husband Ramón is the “unspoken half” of everything she writes. Experiencing different cultures was always a reward for performing well academically. At age ten, Laura D. Nolasco was taken to local Chinese and Japanese restaurants, where she learned to use chopsticks and became so mesmerized by the hibachi-style cooking that she spent the entire time watching instead of eating. Travel also became food for the soul when she was offered a trip to Toronto, Canada at age twelve. Laura D. Nolasco has taught French and Multicultural/World Literature at various colleges in the Greater Rochester area. This book is her first attempt at appeasing what Clarissa Pinkola Estés calls la hambre del alma (starvation of the soul) through the spoken word.